Wire is used to electrically connect circuit parts, devices, equipment etc. There are various kinds of wiring materials. On this page, I introduce the type that is used for the assembly of electronic circuits. It is also used for jumper wiring. Twisted strand wire can bend freely, so it can be used for wiring on the PWB, and also to connect discrete pieces of equipment. If single wire is used to connnect separate equipment, it will break soon, as it is not very flexible. It is convenient to use the single tin coated wire of the diameter 0.32 mm for the wiring of PWB. If the diameter is larger, soldering becomes a little bit difficult. And if the diameter is too thin, it becomes difficult to bend the wire the way you want it to stay. It's best to use whatever wire you are comfortable with, and not worry about those things. If you want to connect separated parts on the PWB, twisted wire covered with soft insulation material is most convenient for wiring. It's convenient to wire the circuit using different color wires for different purposes. Otherwise, wiring the circuit with many wires the same color gets confusing. The photograph on the left shows several colors of twisted wire. The pictured wire is comprised of 7 tin coated wires 0.12 mm each in diameter, covered by very thin PVC plastic. In the photograph to the right is pictured tin coated wire with a diameter of 0.32 mm. It is convenient to use for wiring components, jumper wiring etc. when you are building a circuit on a universal PWB. Pictured at the left is polyurethane wire, 0.4 mm in diameter. It is used for making coils. 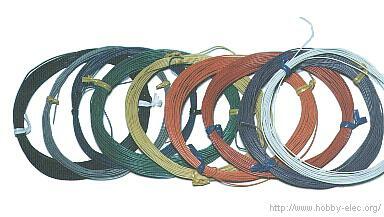 There are several kinds of coated wires. Tin coated wire colored silver, polyurethane enameled copper wire(UEW) which has a thin brown color, polyester enameled copper wire (PEW) which is also thin brown, and enameled wire with a burnt brown color. 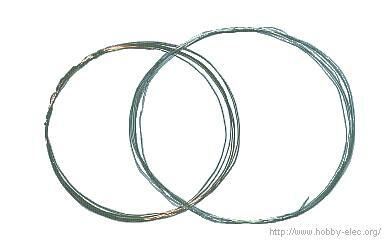 Coated wire is used for making coil components like a transformers. The PEW can not be soldered, because the polyester coating will not melt at the soldering temperature. So if you want to solder PEW wire, you need to scrape the enamel off the wire. In case of the UEW, you do not need to scrape the insulation off the wire, because the polyurethane will melt at the soldering temperature. In this photograph is a tool used for wiring. Copper wire can be drawn out from the tip like the core of a pencil. First, the wire is attached and solderd to the first lead of a given component. Next, the wire is drawn out from the tool and can be soldered at the desired lead of another component. The wire is polyurethane coated single wire of 0.2 mm thickness.